Eggs Benedict Cauliflower Waffles are much like the traditional Eggs Benedict found on brunch menus everywhere, but it is a lower carb version incorporating cauliflower for a healthier option loaded with delicious flavor. 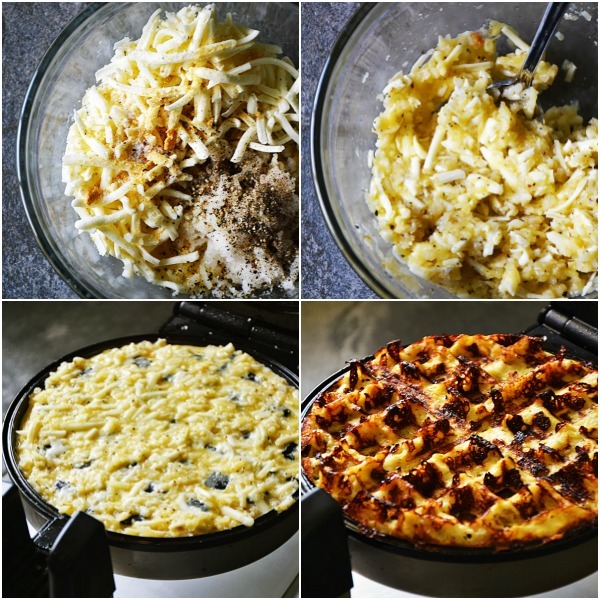 The #SundaySupper Tastemakers dusted off our waffle irons this week in honor of National Waffle Iron Day on June 29th. Who knew there was a special day to celebrate the humble waffle iron, but why not?! It gives us a good excuse to get creative in the kitchen, and judging by all the amazing recipes this week, our #SundaySupper family did just that! Scroll down past my recipe for a list of over 30 of the Best Waffle Recipes on the web! Thanks goes out to Sue, of Palatable Pastime, for her efforts in making this event possible. 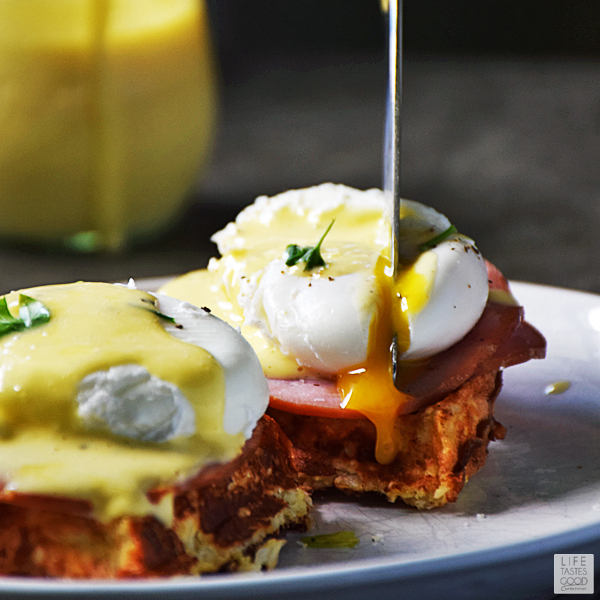 Perfectly poached eggs and Canadian bacon atop cauliflower waffles drizzled with rich, creamy Hollandaise Sauce is a hearty, satisfying breakfast. I don't think you'll miss all the carbs. I sure don't and the hubs didn't either. He gobbled this up and asked for more! For years, Eggs Benedict was one of those recipes we reserved for dining out. I just never wanted to tackle it at home, however, after making it the first time, we realized it's totally doable and so much better homemade! 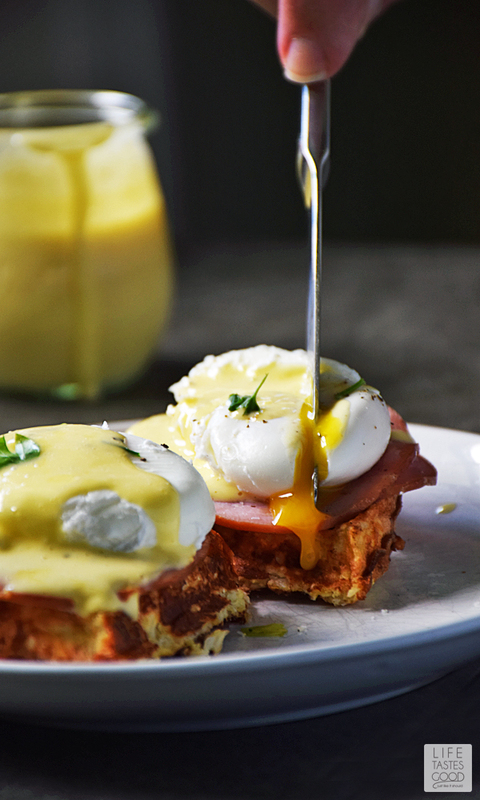 Don't be afraid of making poached eggs or Hollandaise Sauce. 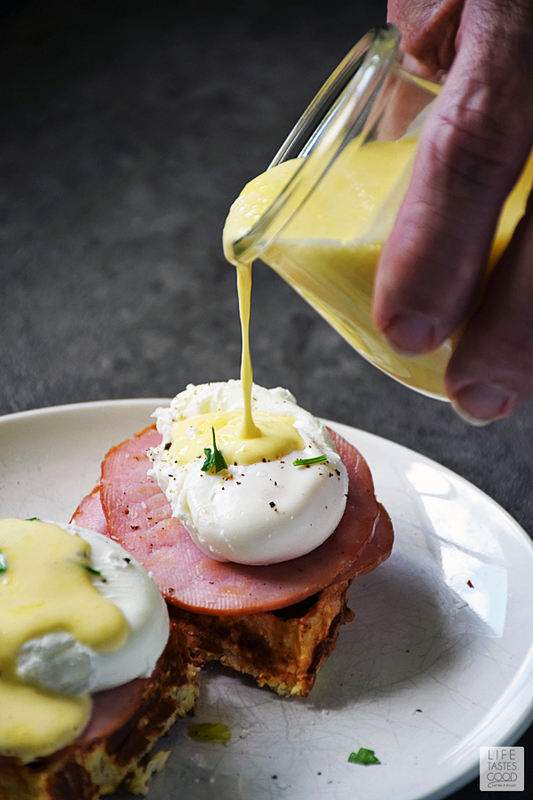 I've got a trick for poached eggs where you don't have to swirl the water and stand on your head to make the whites cooperate, and making Hollandaise Sauce in a blender couldn't be easier. 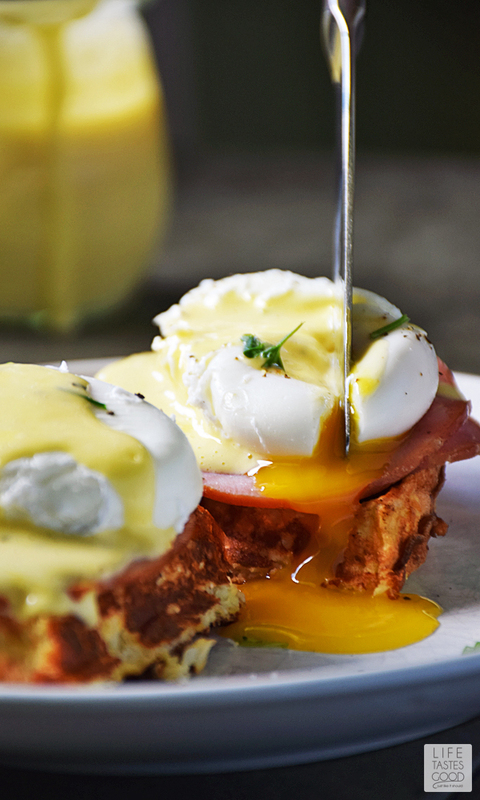 With these tips, anyone can enjoy Eggs Benedict at home. If you follow my plan, this lower carb Eggs Benedict Cauliflower Waffles will be on the table in under 30 minutes. Not too shabby for a fancy pants brunch recipe! Eggs Benedict Cauliflower Waffles isn't the traditional Eggs Benedict found on brunch menus everywhere, but it is a lower carb version incorporating cauliflower for a healthier option loaded with delicious flavor. Use a Belgian Waffle Maker and heat to a medium setting. In a medium bowl, combine 3/4 cup frozen cauliflower crumbles, 1 cup shredded Mozzarella cheese, 1 beaten egg, 1/4 teaspoon garlic powder, 1/4 teaspoon onion powder, 1/4 teaspoon kosher salt, and 1/8 teaspoon freshly cracked black pepper. Mix well until combined. NOTE: I grate fresh cauliflower using my food processor and store the cauliflower crumbles in the freezer. However, you can pick up cauliflower crumbles in your grocers freezer case. If you use freshly grated cauliflower I recommend adding an egg white to the mixture. Grease waffle iron well and spoon the cauliflower mixture onto the waffle iron. Make sure the mixture goes to the edges, but don't overfill. Close lid and flip over. On the number 3 setting of my waffle iron, it cooks for about 3 minutes and that seems to be perfect for this recipe. If you aren't sure how long your waffle iron will cook, I recommend setting the timer for 3 minutes and checking on it at that time. If it is nicely browned and cooked through, carefully remove the waffle to a plate and keep warm. I flip the iron to the side and carefully loosen it and allow it to slide out onto a plate. While the waffle is cooking, prepare your Hollandaise Sauce in the blender as instructed per the recipe (see link in ingredient list). It is quick and easy to do and has always resulted in perfect Hollandaise sauce for me. Keep warm until ready to use. To prepare the poached eggs, line a plate with paper toweling to have ready when the eggs come out of the water. Add water in a saucepan to fill the bottom about 2-3 inches deep. Bring the water to a slow boil over medium heat. While waiting for the water to boil, drain the eggs. Crack an egg into a fine mesh strainer and allow the thin part of the whites to drain out into a bowl. 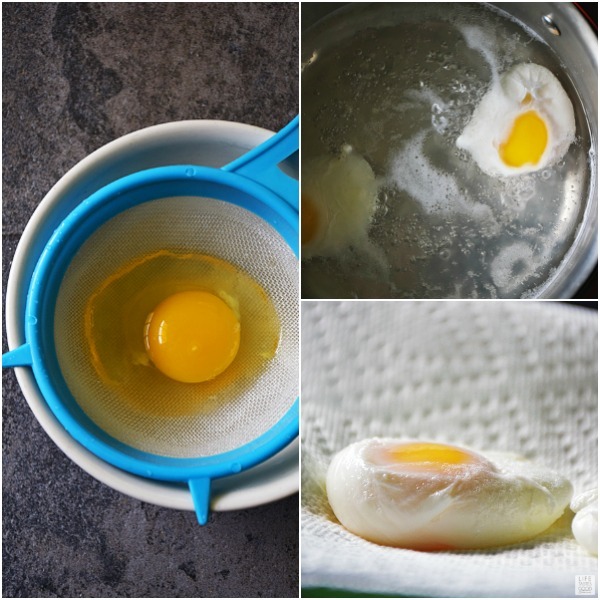 Transfer the drained egg into a separate bowl and continue until all eggs are drained well. The thin part of the egg is not necessary and causes issues when trying to poach the eggs. I prefer to just drain it out and not mess with it. When the water is up to a slow boil, gently lower each egg into the water. DO NOT SWIRL the water. Because we removed the thin part of the egg white there is no need to spend time swirling the water. Make sure the water is maintaining a slow boil and set the timer for 3 minutes. When the timer goes off, use a slotted spoon to transfer the eggs to the prepared paper towel lined plate. While the eggs are cooking, heat the Canadian Bacon in a small skillet. The bacon I used was thin, so I used 2 slices per serving and it worked well. To assemble: Put 1/4 of the Belgian Cauliflower waffle onto each plate and top with 1-2 slices of Canadian Bacon. Top the bacon with 1 poached egg. Salt and pepper the egg to your liking and drizzle on Hollandaise Sauce. Garnish with freshly chopped parsley and enjoy! 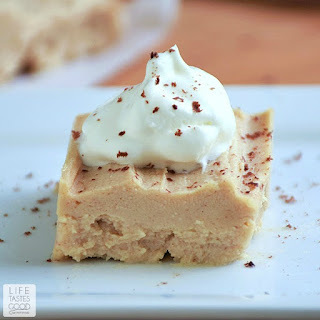 These look so delicious, and I love that they are low carb! You are so creative! I need to make these for the future. What a creative waffle! I love cauliflower and working with it in different ways. I just bought my first local cauliflower of the season yesterday! That makes two of us cauliflower lovers, Laura! Well, three if you count my husband. He is always pestering me to pick up more :) I love how versatile it is. Thanks for stopping by today! I am so in love with this Marion! It is the perfect savory breakfast bite! 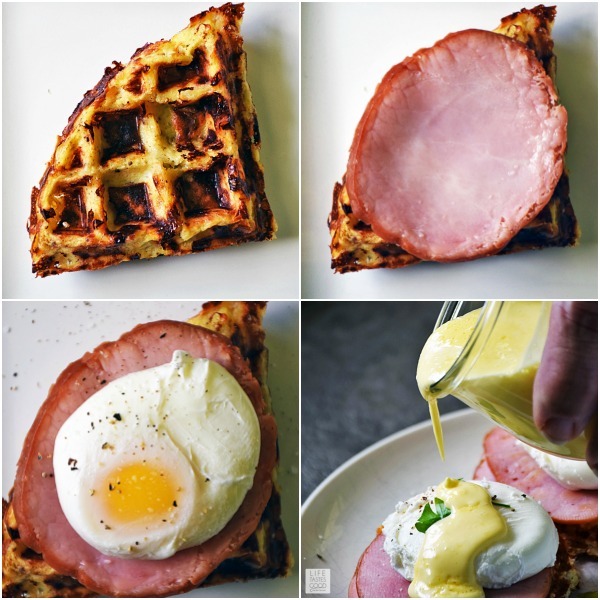 What a fabulous idea to make a cauliflower waffle---sounds like a most delicious base for your Eggs Benedict! It's our new favorite way to enjoy eggs benedict :) Thanks, Liz! These are gorgeous and sound amazing! Mmm. So very delicious and healthy looking. Thank you for the poached eggs tip. 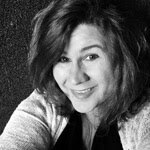 I've been a vinegar and swirler previously but that may be changing soon! I was too, Kim! So much easier to just drain it, drop it in the water, and forget it for 3 mins :) Thanks!! I seriously can not wait to try this. Looks amazing! So cleaver using cauliflower as a base! Yum! These are so unique! Eggs Benedict is one of my favorite breakfasts and I love that these are gluten-free and low carb. Fantastic! I've been eating low-carb at home, and have made several low carb swaps for pasta, pizza, etc...but cauli waffles?! Marion, you're my hero. I think I will try these on Sunday for my husband! Hello! This recipe looks amazing, can't wait to try it! Quick question - can you explain why you use frozen cauliflower? Why is it better to use frozen or fresh? Thanks you! The frozen cauliflower helped the batter hold together more, but you can use freshly riced cauliflower. I recommend adding an extra egg to the batter when using fresh. I hope that helps!